Angles are a fundamental building block for creating all sorts of shapes! In this tutorial, learn about how an angle is formed, how to name an angle, and how an angle is measured. Take a look! What are Acute, Obtuse, Right, and Straight Angles? Did you know that there are different kinds of angles? Knowing how to identify these angles is an important part of solving many problems involving angles. Check out this tutorial and learn about the different kinds of angles! How Do You Use Complementary Angles to Find a Missing Angle? If two angles are complementary, that means that they add up to 90 degrees. 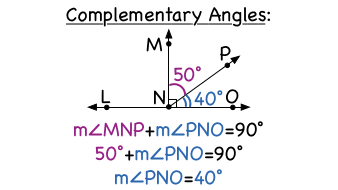 This is very useful knowledge if you have a figure with complementary angles and you know the measurement of one of those angles. In this tutorial, see how to use what you know about complementary angles to find a missing angle measurement! How Do You Find a Missing Angle in a Right Triangle? Trying to find a missing interior angle measurement in a triangle? See if you're working with a special type of triangle such as an equilateral or isosceles triangle. If you are, that knowledge can help you. In this tutorial, see how identifying your triangle first can be very helpful in solving for that missing measurement. Take a look!